Far Cry 3 Aced In The Hole follows the Black Gold main story quest. 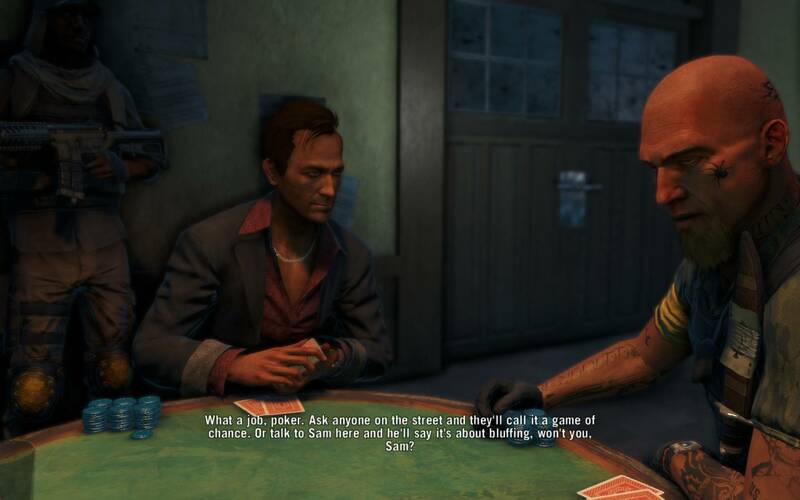 In one of the previous quests Hoyt asked you to join one of his poker games. After weakening his organization by destroying fuel depot and the satellite dish it is time to take him up on his offer. Warning this is the POINT OF NO RETURN!. Access to the island, quests, and activities will be restricted once you start this quest (though you can continue them after completing the game). Be sure to save your progress before starting the quest. Fast travel to Hoyt’s Compound. The Hoyt Compound map location. Sam will be waiting for you at east gate. After you talking with him you’ll both be ready to go. Get close to Sam to start conversation. Next scene takes you to a poker game with Hoyt. Poker games are fun, right? Early on Hoyt reveals the real reason he organized the poker game. He kills Sam and lets you know that he is well aware of who you are. Soon after you find yourself betting your life in Hoyt’s poker game. After a couple of rounds Hoyt cuts one of your fingers and the final battle starts. During this part you will need to rapidly press the buttons that appear on the screen in order to defeat Hoyt. Combat will restart if you fail. Hoyt will also reveal the location of your little brother Riley. Successfully complete the event and Hoyt will get what he deserves, but you find yourself in whole new situation. Poker game with a new bet. Stay focused and hit the right buttons!